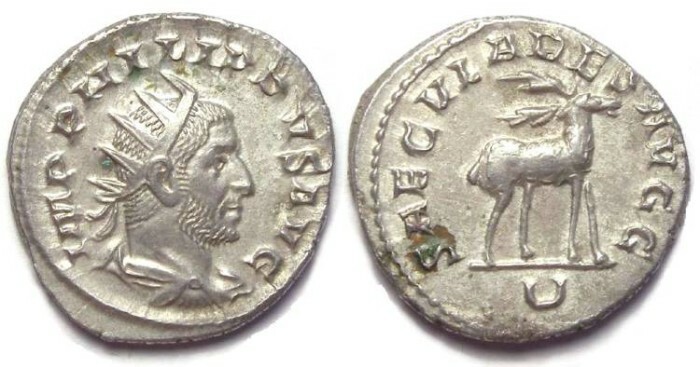 Philip I, AD 244 to 249. Silver antoninianus - 1000 th anniversary series. This type was struck as part of a series commemorating Rome's 1000th anniversary. Size : 21.8 x 22.1 mm. Weight : 4.15 grams. Grade : XF/gVF with a minor area of encrustation on the reverse. Obverse : Radiate bust of Philip I right, with IMP PHILIPPVS AVG around. Reverse : Stag standing right, with SAECVLARES AVGG around, with U below.